Fan Friday Giveaway: Your Favorite Moisturizer! What’s your favorite Mario moisturizer? Would you like to win it?? We’re doing the Fan Friday Giveaway a little bit differently this week. Instead of commenting on this blog to enter to win, simply follow us on Instagram and post any image with hashtag #MBMOISTURIZER. Feel free to use our image if you like and make sure that you follow Mario Badescu! Are you sure you’re using the right cleanser? This ingredient is amazing for your skin. How to get the perfect shave. *One contest entrant will win their favorite moisturizer. This Instagram contest is open to residents of the U.S. and Canada; you may enter to win this contest between August 16-18, 2013. We will announce the winner on Monday, August 19, 2013. I use the buttermilk, it’s the only one I have tried. My mom said my face needed it and gave me some to try a couple years ago and I have been hooked ever since. I can tell when I don’t use it. My skin is very sensitive and it seems to work good. I get a little red around my chin n mouth when I first put it on but my mom says it’s cause my face is so dry there. It definitely keeps my skin moisturized and healthy looking. I don’t use instagram so I just posted here so I guess I got no chance of winning but either way I’ll still use the buttermilk lotion. The honey Moisturizer leaves my skin silky smooth.. I couldn’t ask for a better moisturizer.. I don’t use Instagram. Too many online profiles and such to keep track of. So I will add my 0.02 here. Buttermilk and or honey. Sooooo goood. I love everything I try and want to try everything! I don’t have an instagram account. How else can I enter? 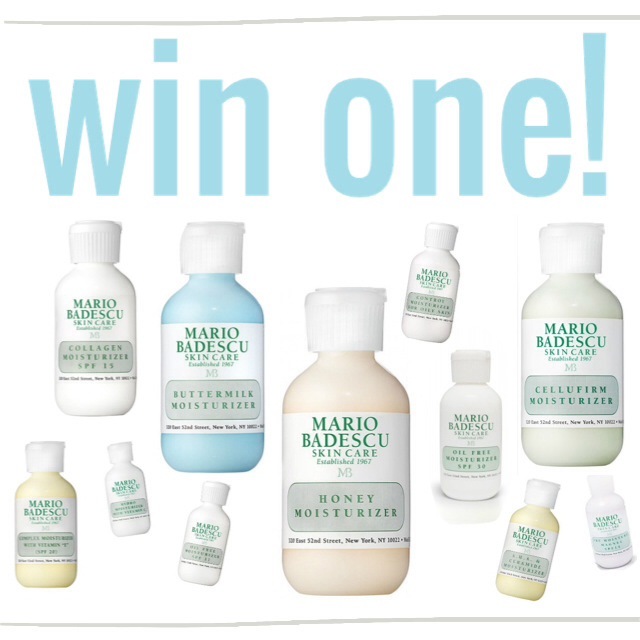 I don’t have an instagram account but I would like to enter because Mario Badescu is a favorite of mine and I love the collagen moisturizer.How else can I enter? I am a big fan of Mario Badescu moisturizers. They prep my skin for makeup perfectly, and keep it from breaking out! I’ll never switch brands. Love all I’ve tried. Buttermilk, collagen, honey, cellufirm. All wonderful. Leaves your skin soft and not greasy. They don’t have an overpowering smell like a lot of face creams. Loyal Mario customer for years. honey moisturizer is my favourite. cellufirm moisturizer… its my birthday… have to look good.!! I may have to use a friends account, but I will give it a shot!